January 5, 2015 by David Shields. Average Reading Time: about 8 minutes. 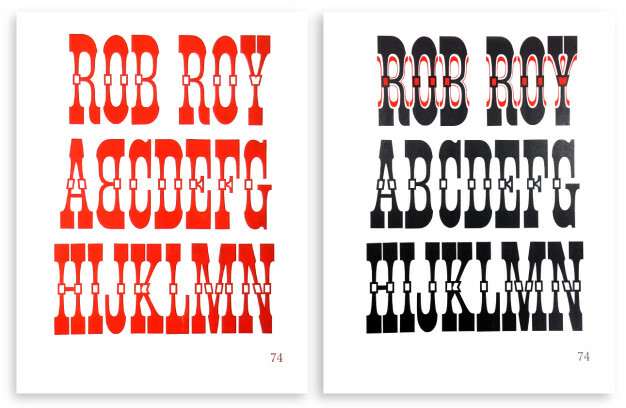 In 1964, Rob Roy Kelly, noted design educator, collector and historian, published a limited edition folio of the wood types he had collected over the previous eight years. 2014 marked the 50th anniversary of the publishing of this important work. “I was printing a book, about a subject that I knew absolutely nothing about.” (Kelly, “Search & Research”). 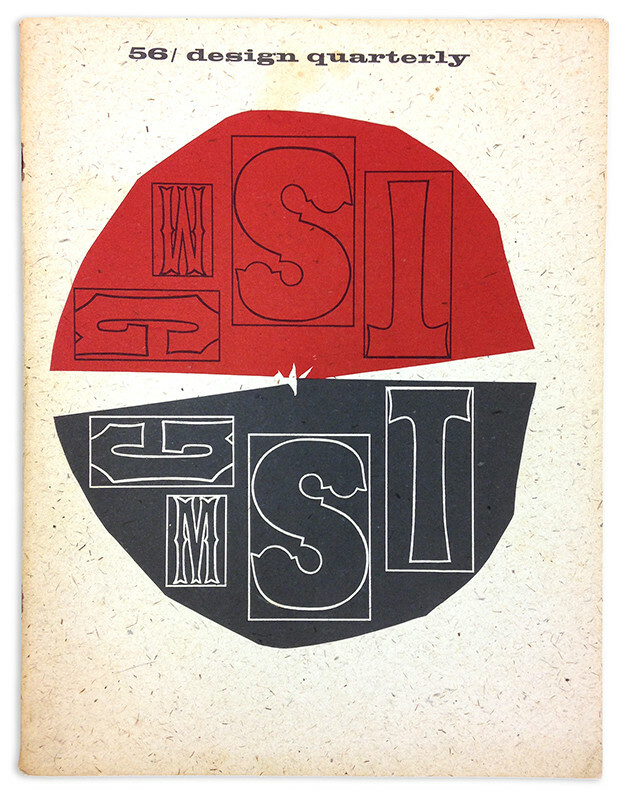 Early version of the bound paper cover, 1959. 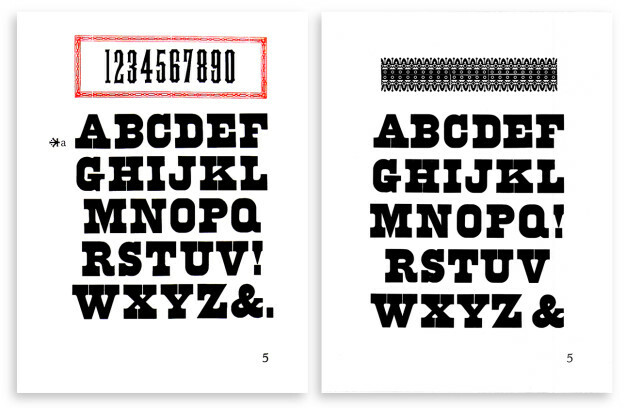 The folio specimens initially grew out of the simple, pragmatic need to proof the collected type. 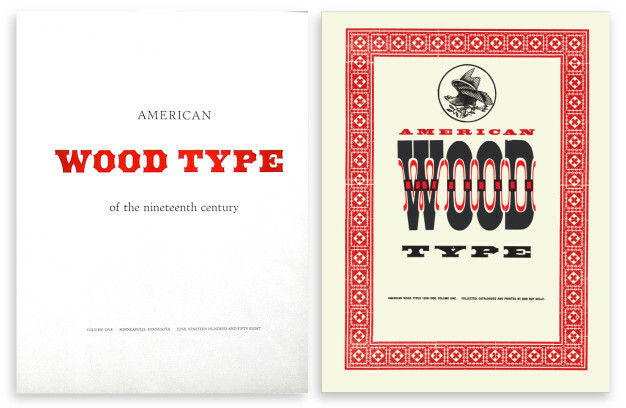 “I wanted to record them [wood type] and began the process of printing 17 × 22 inch specimen sheets. I do not recall why, but from the beginning, the sheets were numbered. As pages were printed, I needed to find additional designs in order to print more pages.”3 The paper stock (100lb Strathmore uncoated cover) that he used for the printing of the folio had been secured through a local paper merchant. The 17 × 22 inch paper size was chosen as it fit the the reciprocal-bed Hacker press housed, at the time, in the Graphic Design Department that was used for printing all of the specimens. Two versions of the bound paper cover, early version June, 1958 (left) and final version 1964 (right). A set of early proofs held at the Hamilton Wood Type & Printing Museum5 show that Kelly was printing at least as early as June, 1958. The specimen sheets date from mid 1958 to the early 1960s and show initial versions of page composition and experimentation. Perhaps most interesting is that the specimens make clear what types Kelly had collected by the early 1960s and—as some of the types shown were not included in the final collection—what he may have used to trade for more exotic types. “I had a number of duplicate fonts reserved just for trading.”6 It is unclear if these prints may have been collated and sold as early attempts by Kelly to raise funds to support further research, or if they were printers’ overage that were gifted to friends and interested parties. 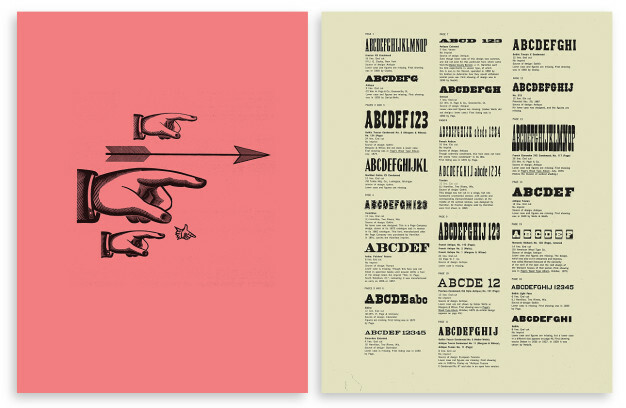 Two versions of folio page number 5, early version 1958 (left) and final version 1964 (right). 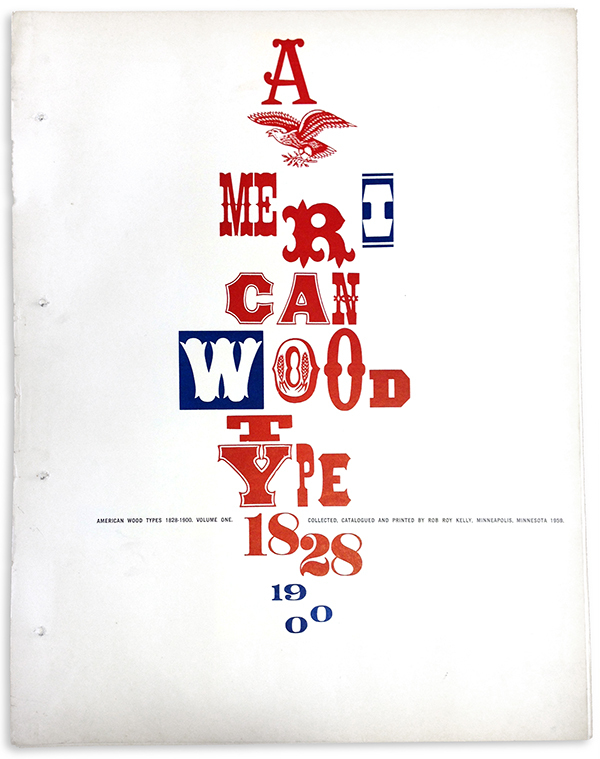 Up until 1963, the research component of Kelly’s work with wood type had been collected only as disparate notes, photocopies and microfilm of specimen catalogs from archives he had visited. At the invitation of Martin Friedman, the Director of the Walker Art Center where Design Quarterly8 was published—and where Kelly was the staff designer at that time—Kelly agreed to write and design an issue of the periodical that would be dedicated to American wood type. As the manuscript for the periodical began to take shape, Kelly was assisted by Georgia Beaverson the staff editor for the Design Quarterly. 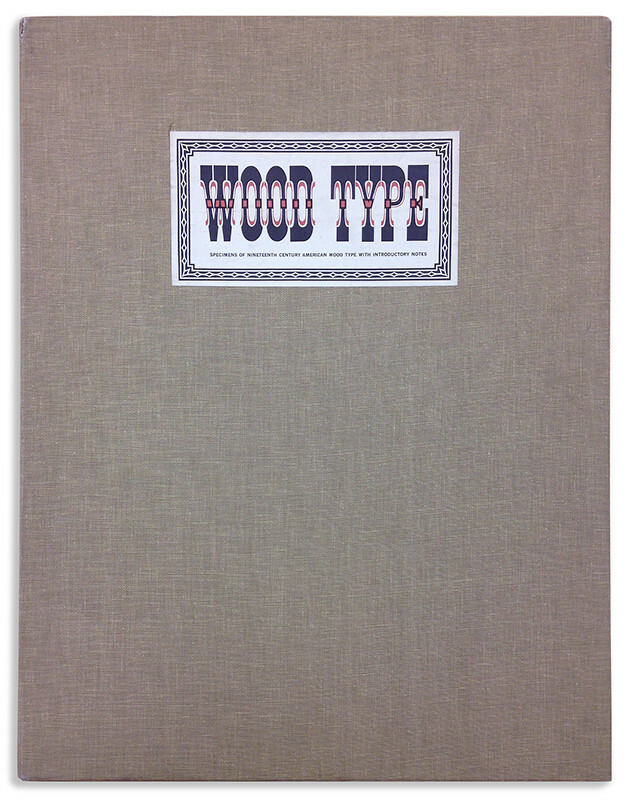 The work on the publication revealed to Kelly the shortcomings and gaps in his own research and led him “to the decision to pursue the research and publish a definitive book on wood types.”9. His research was first published in Design Quarterly issue no. 56, in late 1963. In the spring of 1964 Kelly accepted the offer to become the Chair of the Department of Graphic Design at the Kansas City Art Institute. “Faced with the possibility of moving several hundred pounds of printed materials, approximately 2 tons of wood type and considerable research materials”10 Kelly decided to complete the specimen portfolio before departing for Kansas City. 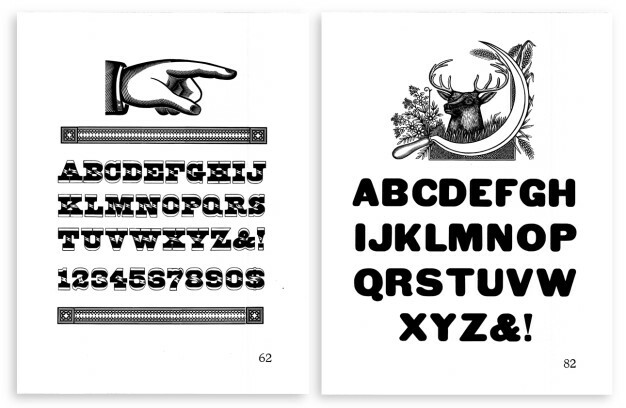 Two versions of folio page number 74 from 1964, proof (left) and final (right). Final versions of folio page 62 (left) and page 82 (right). Final versions of fly sheet (left) and page index page (right). Today, 50 years after the folio’s first publication, 27 of the 45 copies have known recorded locations and have been accounted for in the hand list of Kelly’s folio that I developed and maintain on this blog.